I mentioned in the Top 10 Fall Must Haves that I would give you a totally separate video on various ways to wear the “It” shirt for Fall. I like to keep my promises! The 70’s suede skirt may not be for everyone, but I definitely think it’s a must have for the true fashion mavens. From super casual to girls night out, this skirt is so fun and versatile! Stay tuned for more of the Fall Style Series plus a closet tour! Please keep the questions coming. Have you missed me? I’ve sure missed you! Fall is every fashionistas favorite time of the year and it feels so good to be back in front of the camera taping new style tips for you! We’ll be creating a Fall Series with everything you need to know to look and feel your most fabulous this season without breaking the bank. I’ve dusted off the shelves, pulled out the boots and cleared the clutter a bit. I encourage you all to take a weekend afternoon and get your own closet feeling like a sanctuary. First up in the series is the top 10 must have clothing items. Ask a question and I’ll do my best to answer during the Fall Series. 5 Fall Styles You Can Wear NOW! We are all so ready to put away the flip flops, maxi sundresses and shorts, but Mother Nature is not cooperating here in the South. All of the September mags are taunting us with rich colors, suedes and faux fur, but I’m sweating just thinking about putting on a shearling coat right now! The temps are still fluctuating in the 90’s here in Texas, but we can begin to incorporate a few of the hottest Fall styles into our wardrobe while still keeping comfy and cool. Can I just tell you how happy I am that fringe is still holding strong? I’ve been wearing a fringe bag all of 2015 so if you haven’t tried the trend yet- this Fall is the time to do it! 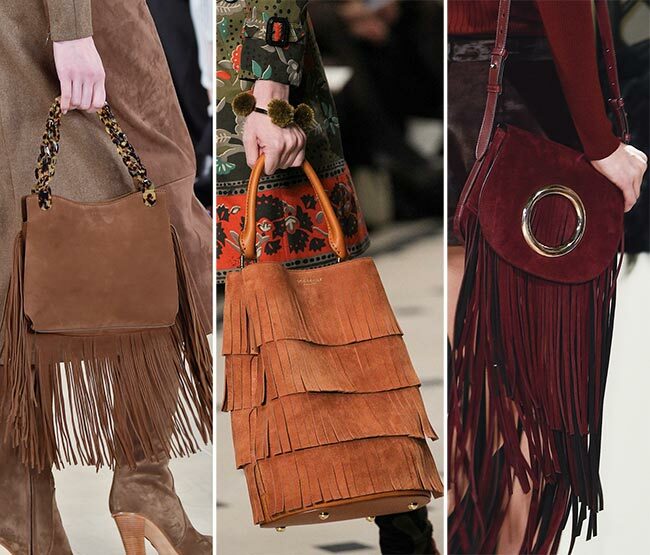 As the temps drop, rock a fringe jacket, but not at the same time as the bag. TIFF’S TIP: One fringe item at a time please! You don’t want to look like a bad country singer. I’ve always loved the snap up 70’s skirt and had one years ago. Dang it, I wish I still had that skirt! 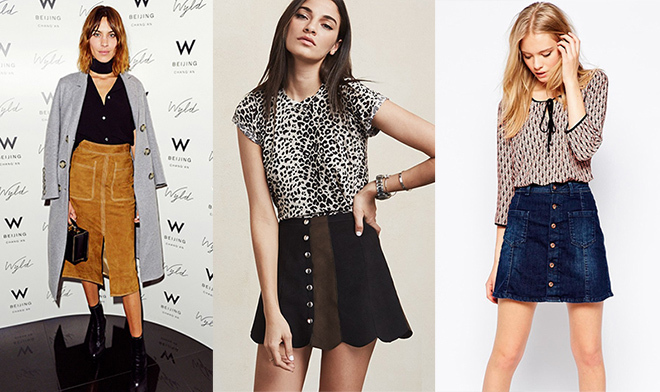 From a denim midi skirt to a suede mini, this is the IT skirt for Fall 2015. TIFF’S TIP: Add a modern blouse or blazer (instead of doing head-to-toe 70’s) to keep from looking like you just walked out of a thrift store. The white blouse is a wardrobe staple and I better find a great one if each of your closets! Ya hear. But, this Fall it’s all about the romantic girlie vibe when it comes to any type of blouse especially a white blouse. Try one with ruffles, statement sleeves, embroidery or oversized collars. 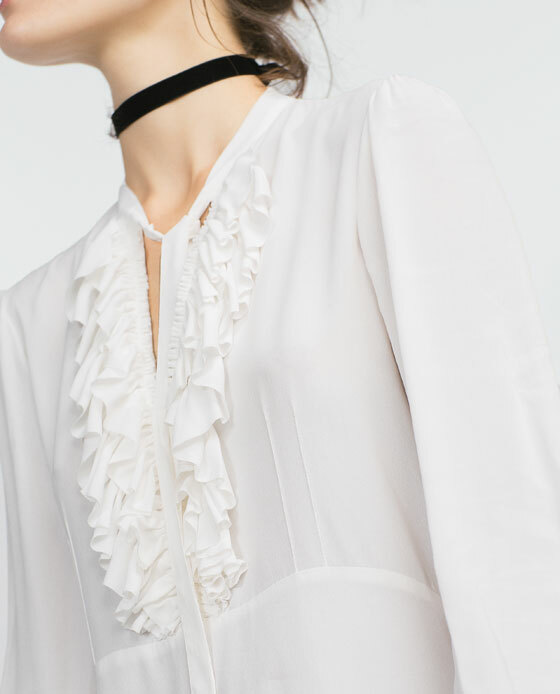 I love this frilly one from Zara! TIFF’S TIP: Go for more modern frill instead of oversized ruffles to keep from looking like Capt Jack Sparrow. You know I am obsessed with booties! I am also obsessed with suede so I am stoked for it to explode this Fall on everything from boots, booties, handbags, skirts and jackets. To keep your legs cool while it’s still warm out, grab a fab pair of suede booties then switch to knee high or over-the-knee when it gets cold. TIFF’S TIP: Don’t forget to spray your new suede items with a suede protector. I have forgotten this in the past and ruined some amazing suede shoes! BooHoo. This is my absolute favorite pant this year. Flared jeans and slacks lengthen the leg and allow your calves to breathe. My favorites are by J. Brand because the denim holds you in like spanx and are so flattering. (I get compliments every single time I wear mine!) TIFF’S TIP: I cannot stress enough the importance of the length when you wear flares. If they are too short..well, JUST DON’T DO IT! This cheapens the look and will actually shorten your legs. Remember to shop your closet before making unnecessary purchases. Which of the 5 will you start wearing NOW? I’ll be back with a longer list of my Fall favorites via video! I’ve been doing my “research” and have comprised a great list. Blessings for a Spectacular September! Take some time to set your intentions for the month and take it a step further and visualize how you want the remainder of 2015 to play out. Staying stylish is important to feel confident and put your best image out into the world, but you MUST start with your spirit first. Our outer world reflects our inner world! SET YOURSELF UP FOR SUCCESS, SISTA!